Our most popular brand of replacement windows for homes of savvy homeowners. Milgard is the best brand of windows for homes. Chose from Vinyl, Wood or Fiberglass windows and patio doors in 15 colors. By far the best warranty of any window brand. Milgard Essence is the top of the line replacement window for homes. The Essence is Milgard's most revolutionary window since their first retrofit replacement house window. Milgard Essence is a wood window for homes with a powder coat fiberglass exterior. Milgard has the best warranty of any major window brand. Milgard windows are custom sized by advanced computerized machinery. This means Milgard can make windows to fit right and install in less time. Milgard Essence is the smoothest sliding window. Milgard Woodclad is a fiberglass window for homes with vertical grain fir on the interior. Vertical grain fir is an expensive wood and stains nice. The fiberglass exterior is weather proof and maintenance free. The Woodclad Windows work very well, are very easy to open and close. The locking mechanism is very easy to use and secure. Plastpro is a very popular way to have a paintable fiberglass door. Give your home privacy when you want it, light when you need it. (good prices, high quality blinds). Jeld-Wen Jeldwen Fiberglass high end front doors for homes. Fiberglass that looks just like high quality wood. Popular choice for upscale homes with exposure to the sun and rain. Masonite is one of the oldest companies that have set many standards for the door industry. Their doors are built to be affordable but durable. Masonite is used by professionals as a good way to get the best balance of quality and cost. Therm-Tru has a large section of fiberglass doors for your home. Therma-Tru has a few fiberglass doors up to 42" and a good selection of 30" doors. Do to distribution problems we are no longer carrying ThermaTru doors. 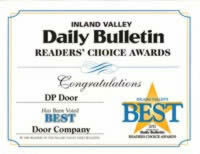 Most popular, largest selection of doors. Art Glass: (High End) My favorite, these are hand crafted in Ventura California. Jeld wen Doors in wood are often available in fiberglass and visa versa. Affinity Doors The Ultimate in Custom carved doors! Simpson traditional house doors. Craftsman style doors for the front of your home, French doors for the patio or anywhere you want a view. They have traditional styles from simple laundry room doors, interior doors to leaded glass entry doors. Handles for Milgard Essence and Milgard Woodclad french doors. Replacement Windows Pictures of jobs we've done in homes like yours with wood, fiberglass and vinyl replacement windows and patio doors. The pictures of windows in homes are in our service area of Rancho Cucamonga, Claremont, Upland, Diamond bar, The beach, desert and mountains, From Palm Springs to Los Angeles, San Clemente to the high desert. 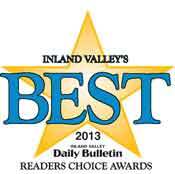 We have special replacement windows just for the Big Bear, Arrowhead area and of course Mount Baldy. Milgard Tuscany is the standard in replacement Windows, great look backed by a great warranty..
Arrowhead and Big Bear Windows for cabins. Cabins in our local mountains often need a soft wood interior and a weather proof exterior. Milgard Essence is the high-tech energy efficient window that has the warm look of natural wood. Wooden windows are no longer hard to open or maintain. Milgard Essence works better then any vinyl or wood window while having the aesthetics of a old fashion wooden window. Available in Double Hung, Casement, Awning, Picture and horizontal gliding. The inside has a option of stain grade wood, either pine or Douglas fir. The outside of the Essence Window is a fiberglass with a baked on powder-coat that is harder then paint (and looks better too). There are 15 colors for the exterior of the Essence window. The inside can be stained or painted any color. DoorMerica interior doors with glass, pantry, laundry room, kitchen and more for in your home. JELD-WEN for bedroom doors, closet doors and hallways. Superior Replacement Windows and Patio Doors for homes Very good prices, good selection of decorative glass, Has best price on budget sliding glass doors. These doors are often call Bullet Proof but no door or window is bullet proof. We also have burglar resistant (called burglar proof) windows. D.P. Door Company's catalog page of web site. Pictures on our web site are of our jobs. Text, art, photos are not to be copied except for personal use by our customers. All rights reserved.